It’s very common for a lot of people to unconsciously use food as a natural medicine to ease their pain and / or feel better in times of intense stress. Almost everyone can remember a case where chocolate was used as a comfort when something went wrong. What does this tell us? In simple terms our mood affects our food choices and the diet is associated with our mood. There is much evidence to back up the above claim and prove that a diet can improve mood and help increase energy levels. Food affects the biochemistry of the brain (improving our mood) provides sufficient energy for proper functioning of the body, regulates the metabolism and helps to stabilize blood sugar levels. Carbohydrates are among the most misunderstood food group, as many have demonized them and some diets even recommend to completely removing them from your plate. Of course this is not true as long as you choose the right type of carbs! Carbohydrates can improve mood because they increase serotonin levels in the brain, a substance (neurotransmitter) that promotes good mood. This is achieved by increasing the levels of tryptophan in the brain, an amino acid essential for the synthesis of serotonin. Gone midday and feel empty, without energy, you’re nervous and you cannot concentrate to make even the simpler tasks… if this happens to you then you belong to the category of people who do not eat breakfast or intermediate snacks so your blood sugar levels drop making you feel lousy. 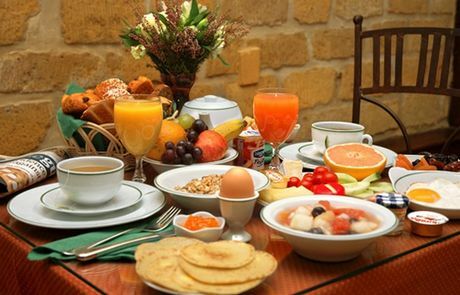 So make sure not to skip breakfast and if possible eat small snacks between meals. Research shows that breakfast (except weight regulation) can boost spiritual work and improve memory. The famous omega-3 polyunsaturated fatty acids are mainly known for protecting against cardiovascular disease. In addition to this role, it is essential for the functioning of the nervous system and brain, and appears to influence brain function through neurotransmitters. So make sure to eat fish (like bream, sardines, and salmon) 2 times weekly to recruit the necessary amounts of the healthy omega-3. Maybe the best source of omega-3 is fish, but it is also found in some nuts, such as walnuts. Nuts are very nutritious; eat them unsalted and not roasted for more benefits. Apart from polyunsaturated fatty acids they also contain magnesium, a mineral necessary for the production of energy from the body. Everyone has heard that lean meat (skinless poultry, lean pork and beef) is better than the fattier cuts of meat because they contain so many unhealthy fats. Apart from the issue of fat, lean meat provides the body with a multitude of ingredients that help in having a good mood and maintain high energy levels. Lean meat contains tyrosine, an amino acid that increases the levels of 2 other neurotransmitters in the brain: dopamine and norepinephrine. These substances increase the levels of concentration and alertness. Meat is also an excellent source of iron, the absence of which leads to fatigue. Finally lean meat contains vitamin B12, which is only found in food of animal origin. B12 among other benefits seems to have an antidepressant activity. Green is the colour of hope and good mood. Green vegetables are essential for our health and wellness. Fiber besides improving bowel function it can help maintain energy and good mood during the day through the regulation of blood sugar levels. It is also a rich source of folic acid; a vitamin linked to the development of depression. Adequate water intake promotes the proper functioning of the body. When someone is in a state of dehydration, even mild, the body is not working properly and the feeling of fatigue is emerging. Apart from water you can improve your hydration levels by consuming fresh fruits and vegetables due to the high amount of water they contain. A cup of coffee is a must for anyone wanting an energy boost during a busy and demanding day. Firstly, the process of drinking coffee in itself is relaxing and invigorating. Additionally, caffeine is a stimulant that increases alertness and concentration. But be careful, excessive intake can bring unwanted side effects such as headache and dizziness. Besides coffee, caffeine is contained in tea and cocoa. An important element of quality of life is wellbeing, both physical and psychological. If you follow a balanced diet, adequate sleep and put some motion in your life you will not only improve your mood but your overall health.